Glad you bumped it. This was a fantastic post that I had not seen before. this post has been visited so many times to helped me reference that I needed a 15, 16, 21, and 22/66 in my collection, which I now FINALLY all have. Not many razors prettier than those British Aristocrats. Always a pleasure to see this thread and pasted pictures. I have all of the ones mentioned and totally agree with the OP's thoughts and conclusions.The British aristocrats for me are the shave world equivalent to vintage ferrari's. I too have the bug for Aristocrats and the British Aristocrats are by far my favorites. This site is a treasure trove; especially for beginners! Information like this fuels the interest in making shaving so much more that the daily requirement. For me I started back to DE from cartridge this Xmas. My original goal was to use that as a stepping stone to a Straight Razor and maybe some collecting. 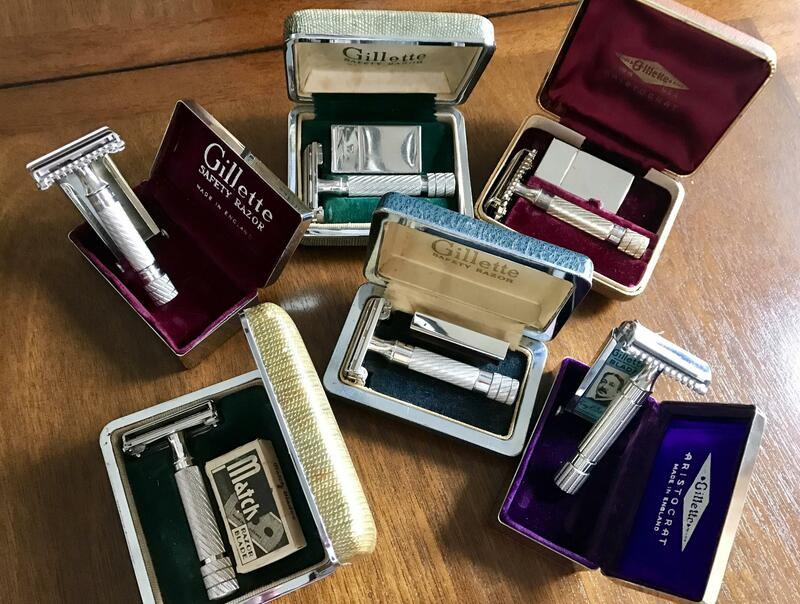 After spending lots of Web time with posts like this; I'm now headed towards collecting DE ("shave worthy" rather than collector quality). Thanks for the in depth info! (02-17-2017, 08:37 AM)RetroRon Wrote: This site is a treasure trove; especially for beginners! Information like this fuels the interest in making shaving so much more that the daily requirement. For me I started back to DE from cartridge this Xmas. My original goal was to use that as a stepping stone to a Straight Razor and maybe some collecting. After spending lots of Web time with posts like this; I'm now headed towards collecting DE ("shave worthy" rather than collector quality). Thanks for the in depth info! If you ever want to take that step up to straight razors, let me know. I think I can help. Thanks Dan; I will certainly do that! Interesting that I started out in the mid-sixties DE shaving; now I'm learning it all over again some 50 years later. Much better results too; the dreaded daily chore has been turned into a pleasant 30 minute adventure each morning. I made a post a day or so ago detailing the differences between two versions of the #15 OC. It has been suggested that one of these is in fact a #20 (the one with no stamps on the handle), however, I have no reason to think it is a #20, given the dissimilarities between mine and that #20 listed on Mr Razor's site. The one listed on Mr Razor's site has a stamped handle. In my post, you will see that there is, in fact, a difference between the heads: the teeth. The #15 with stamps on the handle has thicker, more rounded teeth; the non-stamped handled version has thinner, squarer teeth. Firstly I have found this thread invaluable in my Gillette quest. Second since we are breaking down British aristocrats into heads due to seeking the shaving experience rather than looks would we also argue that the aristocrat jr offer the same shave? I would say no. To me the handle on the Jr. is was too thin and therefore hard to grab comfortably. An HD 500 is closer to an Aristocrat #66 than the Jr with the same head IMO. That is not to say the shaving experiences aren't comparable. Its just that some handles don't feel all that great on my hand and that has an effect on the experience and sometimes even on the final result. I intend to compare a aristocrat junior to the #21 I have. Since they share the same head.